Last week’s contest was won by Poster Child, who found the location along Highway 18 in Maple Valley. This week’s location is related to something in the news from October, good luck! Well it’s not Zucotti Park, unless there are views I can’t grab … but I’m betting on an Occupy site someplace. @2: because of the streetcars, yes. And because of what I suspect to be a kph speed limit on the street (30 mph would be too fast in such a location). 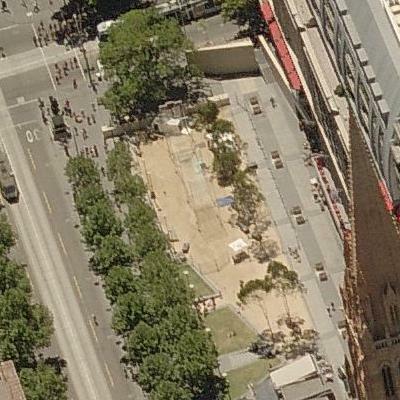 It’s Melbourne, site of a rather unfriendly police response to the Occupy movement. Thanks Lee, I’m living in Australia this year so I’m not sure if it’s a “fair” win or not but I’ll take it. And as an aside, Melbourne is a fantastic city and one of the main reasons is that they wisely kept their streetcar network intact. Look! The streetcars are operated by a private company under contract to the government;”The network is operated under contract, the current private operator being KDR Melbourne, trading as Yarra Trams”. Could we do that here? Nah! No way, so don’t even bring it up. @7 You mean like this? It’s because of private ownership of streetcar lines that we no longer have streetcar lines.